Dozens of police officers were injured and scores of people arrested. The protests also saw the middle-ground Alliance Party targeted, including a death threat against East Belfast MP Naomi Long and councillors' homes attacked in Bangor and Newtownards. 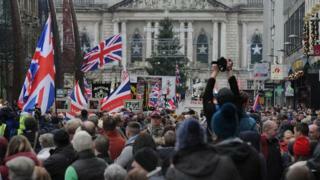 On Monday 3 December, 2012, Belfast City Council voted to fly the union flag at city hall only on designated days. Police were criticised by Sinn Féin for not anticipating the violence. Council staff removed the flag at 07:00 GMT on Tuesday. It is now only flown on 18 designated days. Why is the issue important to unionists? Parades and flags are important symbols to loyalists, who describe them as expressions of their culture. The decision at Belfast City Hall followed a difficult, but not explosive, marching season during which there were numerous arguments and disturbances over specific parades. Many loyalists claimed that some nationalists were trying to erase their identity from Northern Ireland. The unionists argued that the flag had flown for decades above Belfast City Hall and the other parties should have left it alone. Former Police Service of Northern Ireland chief constable Matt Baggott told a press conference on 7 January 2013, after four successive nights of disorder in east Belfast: "I am concerned that senior members of the UVF in east Belfast - as individuals - have been increasingly orchestrating some of this violence. "That is utterly unacceptable and is being done for their own selfish motives. There is no excuse whatsoever for violence, as we've said, and we will be investigating that and taking the appropriate action." Previously, assistant chief constable Will Kerr had said members of both the Ulster Defence Association (UDA) and Ulster Volunteer Force (UVF) had been involved in violence around flag protests and that "we're now seeing senior members actively involved in orchestrating the violence." In the weeks before the city hall vote, up to 40,000 leaflets criticising Alliance were distributed in a joint operation carried out by Democratic Unionist Party and Ulster Unionist Party activists. Alliance accused the unionists of a blatant attempt to ramp up tensions over the union flag issue. Unionists insisted their defence of the flag was a matter of principle and they wanted peaceful, constructive protests. However, with the involvement of loyalist elements, and others using social media, the protests took on a life of their own, spreading well beyond central Belfast. Protests followed in towns such as Carrickfergus, Coleraine and Ballymena. Roads were also blocked in parts of Northern Ireland. The Alliance Party was the target of threats and violence. East Belfast MP Naomi Long was threatened as was councillor Laura McNamee. An Alliance Party office was destroyed in Carrickfergus and councillors' homes attacked in Bangor and Carrickfergus. Why was the Alliance Party a target of loyalist wrath? Alliance holds the balance of power on Belfast City Council, and could have voted down the original motion to remove the flag on all days. Instead it came up with a compromise, suggesting that the union flag should be flown only on designated days. Many of the party's offices are in unionist and loyalist areas and towns, like Carrickfergus and Bangor and so are an easier target than those of other parties, although two Sinn Féin representatives were also threatened.